Remote deposit capture from Heritage Bank lets you deposit as many checks as necessary, without ever leaving your office. Sign, scan, and send — three simple steps and a matter of minutes is all that stands between having a check at your office and us recognizing it in ours. 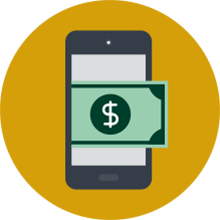 Remote deposit capture also accelerates cash flow, helps protect you against check fraud, and reduces errors in accounting.